I’ve been intrigued but daunted by weaving since a few of my knitting & spinning friends started and I swore I wasn’t going to add it to my repertoire. 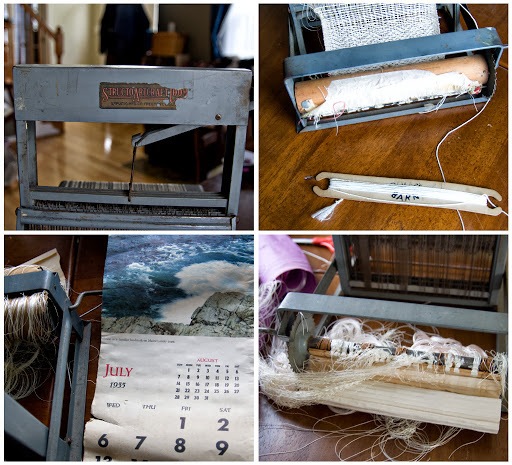 The cost of additional equipment also put me off, even starter rigid heddle looms range from around $100-$300. And floor looms, perhaps the ultimate in looms, take up a lot of space. After some reading, mainly Hand/Eye, an excellent art & craft blog, I realized that not everyone who weaves uses a floor loom, that really weaving requires that your warp threads be under tension Weaving (anything from cloth to rugs) is still a source of income for many people in non-western countries, something that’s easy to forget in the land of cushy convenience. So I made my own backstrap loom following instructions from Weavezine using oak dowels I had around from making my own niddy noddy, clothesline rope, and scrap fabric for the backstrap. After getting everything together, I decided to skip the first recommended project and just began making a back strap, the second project. I clamped some scrap wood to a table, as shown on Weavezine, for an improvised warping board and wound white Bernat Handicrafter Cotton for the warp. I made lease sticks from 12″ crafter’s dowels that I got at JoAnn’s for something else and followed the pictures on Weavezine to get set up and started. I had problems, of course – like making continuous string heddles instead of making heddles on a stick. The back loom bar, the one that attaches to a stationary object, kept slipping to one side and pulling everything with it, including any tension I had on the warp; I eventually hooked the back loom bar around my feet to get enough even tension with the backstrap. 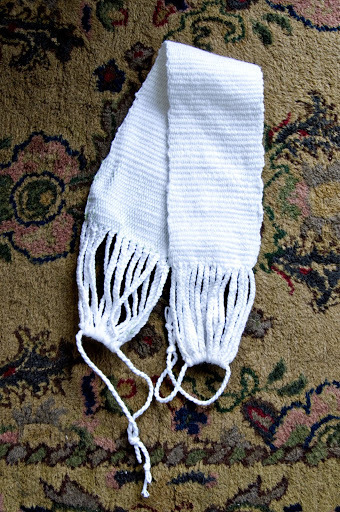 I also didn’t realize the difference between a balanced weave (what I thought I was making, where the warp & weft are equally visible), warp-faced weave (what I was really making, in which the weft is hidden by the warp), and weft-faced weave (the opposite of warp-faced), so I used a different yarn for the first inch or so before I realized that it wasn’t going to be visible at all. I decided I wanted to more than warp-faced weaving on a backstrap. I considered making or getting a rigid heddle, which would allow me to make a more balanced weave. I looked at other loom options, like tapestry weaving and using yarn on a potholder loom or making my own frame loom. I even considered a floor loom (and still daydream about using or having one) but started looking instead at table looms. During one of my ebay forays, I discovered vintage Structo Artcraft Looms and decided to keep an eye out for a reasonably priced one (i.e., something under $150). In early June, I ended up with this little Structo Artcraft 440/4, with a 9″ weaving width and 4 harnesses. It came complete with a project from the 50s still on it, as evidenced by the July 1955 calendar page used in winding on the warp threads. I cleaned the loom, oiled the spots that needed oiling, made a raddle with some wood we had around + finishing nails + the cutest clamps ever, and improvised a warping board.